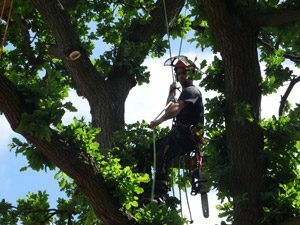 At The Original Tree Surgeons, tree pruning is one of the most regularly requested services that we provide. Tree pruning is a skill in itself, not least because it invariably involves the cutting or removing of part of a live tree. So it is important that the work is carried out with care and attention, ensuring each tree is left in a safe and stable condition, capable of replenishing itself. Given the vagaries of the British climate, regular tree pruning is often an essential part of property or estate maintenance. You may have hefty, destabilising branches vulnerable to high winds or storms. So taking preventative measures, before falling debris damages surrounding cars or property, is something we can’t recommend too highly. And even if wind isn’t the issue, tree pruning is commonly needed where overgrown branches and limbs are blocking out daylight to property or possibly preventing light from reaching to other trees or shrubs. So it’s good to know that our skilled tree surgeons are on hand throughout Kent, Sussex, Essex, Surrey and Greater London to look after all your tree pruning requirements. Before any work is carried out, we will assess the shape, size and species of tree before deciding upon the best possible course of action. Operating with ropes and slings in a controlled and professional manner, we’ll ensure any tree pruning is carried out safely and efficiently. Where a tree is diseased or storm damaged – but can essentially be saved – then we would prune the tree back to the relevant branch collar. Tree pruning is an essential part of our day-to-day work. So if you need help in this important area of tree maintenance, then call The Original Tree Surgeons on 01892 599331.